If you are looking for a vehicle that has the handling of a smaller car along with the room of an SUV, the Mazda CX-3 at Hixson Mazda of Alexandria may be the vehicle for you. This crossover vehicle has a number of important safety features incorporated into the design. 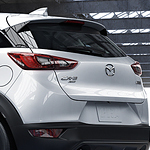 One important safety feature found on the Mazda CX-3 is the lane departure warning system. When you are driving over 44 mph, sensors will begin to monitor the road. If you leave your lane without signaling, both audio and aural alerts will trigger to help keep you and your passengers safe. The Mazda CX-3 also features an important safety feature known as high beam control. At night, visibility is best when you use high beams. The CX-3 will automatically turn on high beams if safe. The Mazda CX-3 will switch over to low beams when traffic prevents the use of high beams.